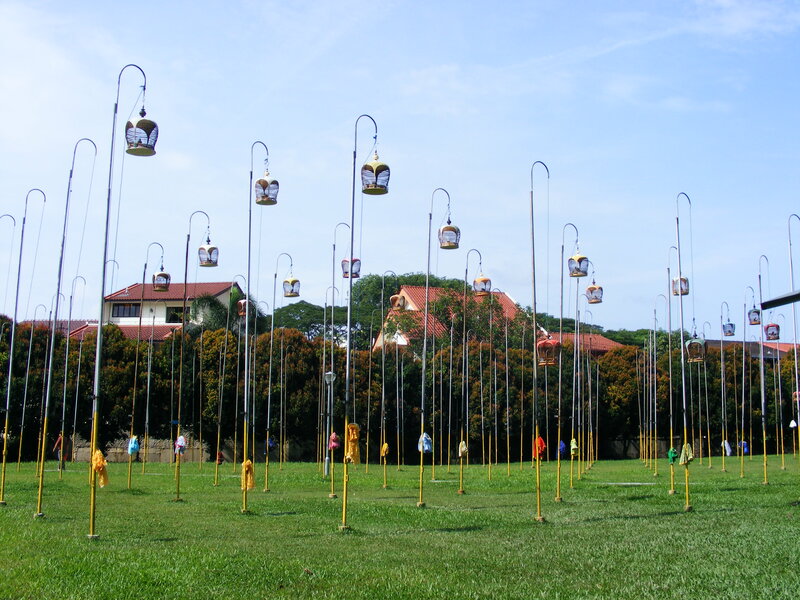 I first heard about the “men with the caged birds on long sticks” soon after arriving in Singapore, and made a mental note to try to find them. A mental note that got misplaced, as mental notes are wont to do. 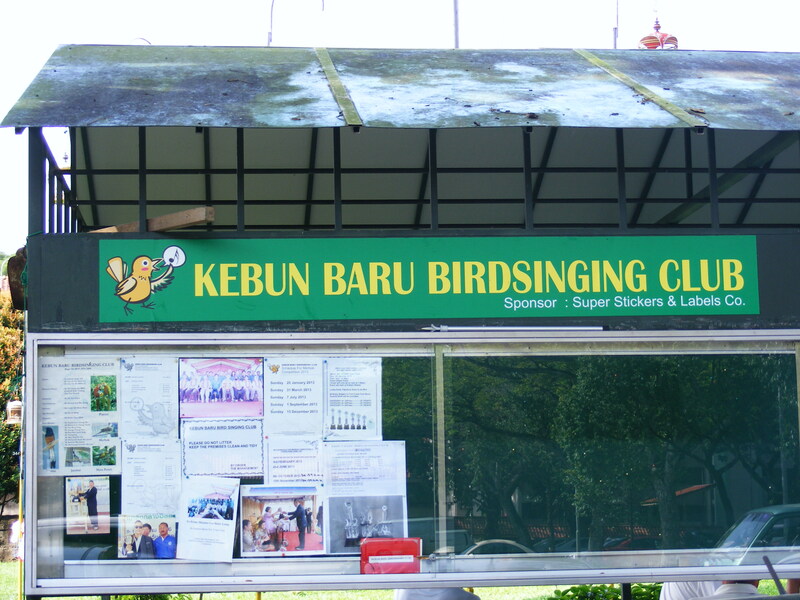 However, the mental note finally reappeared and google located the Kebun Baru Birdsinging Club despite my vague search terms. 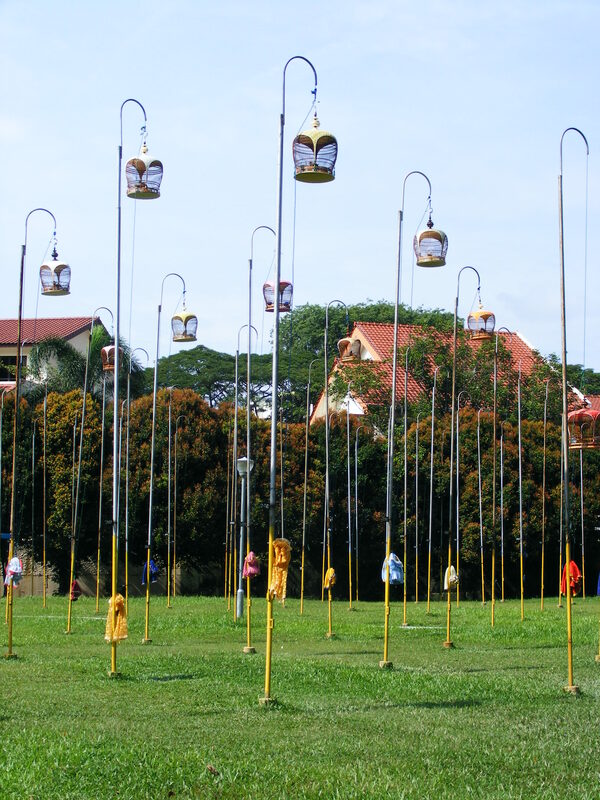 The Kebun Baru Birdsinging Club is located in a field between Block 159 on Ang Mo Kio Avenue 5 and the Ang Mo Kio Town Garden West. There’s plenty of coupon parking nearby and the Mayflower Market is also close. 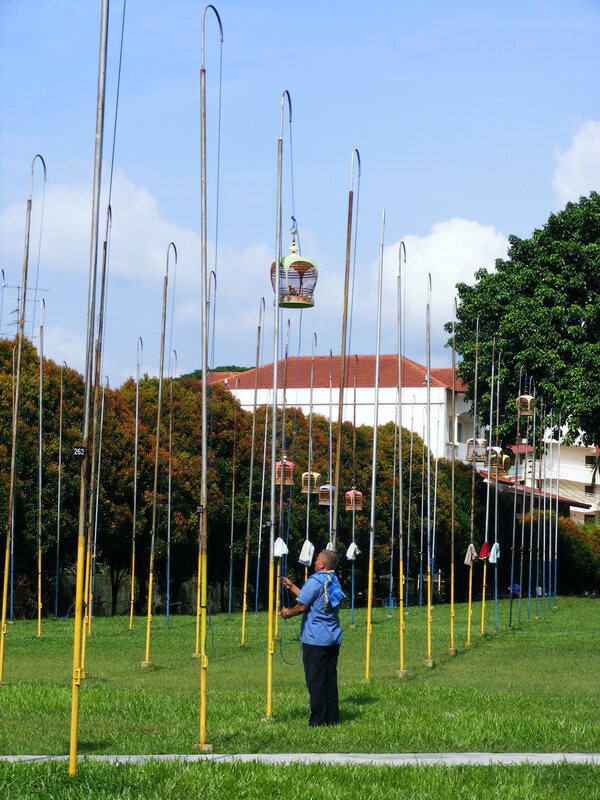 People bring their caged birds to the field where they hoist them up 20-foot tall poles using a rope pulley. Apparently the walk to the field does the birds good as they have to grip their perches tight, and this helps to improve their fitness. 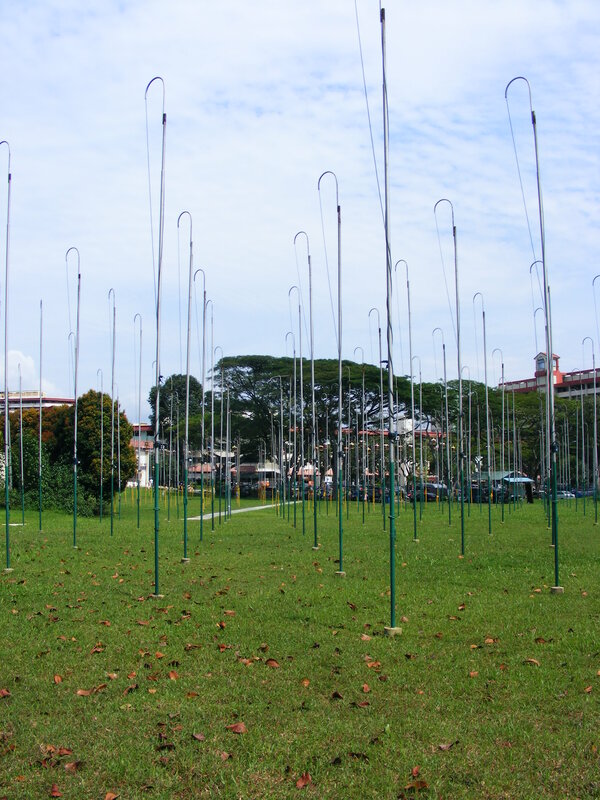 Although only about 50 or so of the hundreds of poles were being used when I visited on a weekday morning you couldstill hear the birds singing, and there were more free birds around than I’ve seen anywhere else in Singapore. I guess birds of a feather…….. 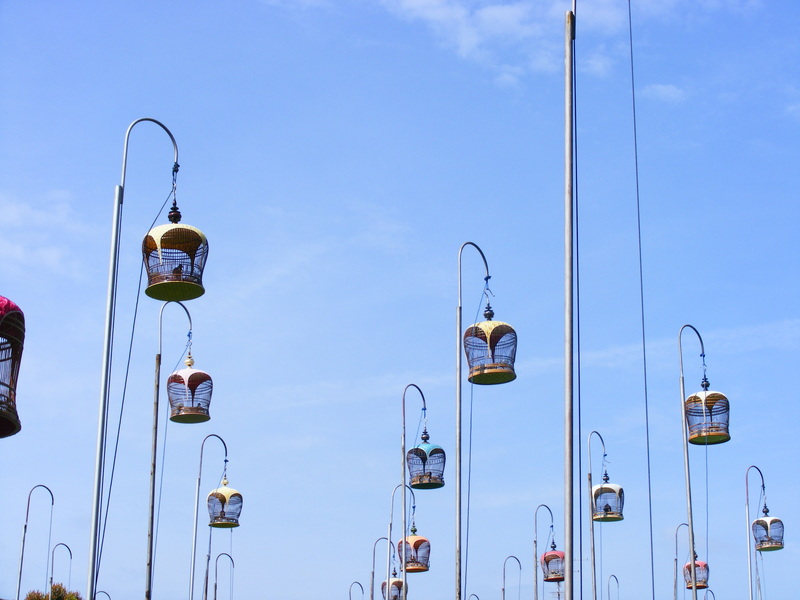 The more the caged birds hang out with other birds the better they will sing, and presumably they’ll have a better chance of winning the regular competitions. I think weekend mornings are the busiest times (and during competitions) but it was still a very unique site on a quiet Wednesday morning. 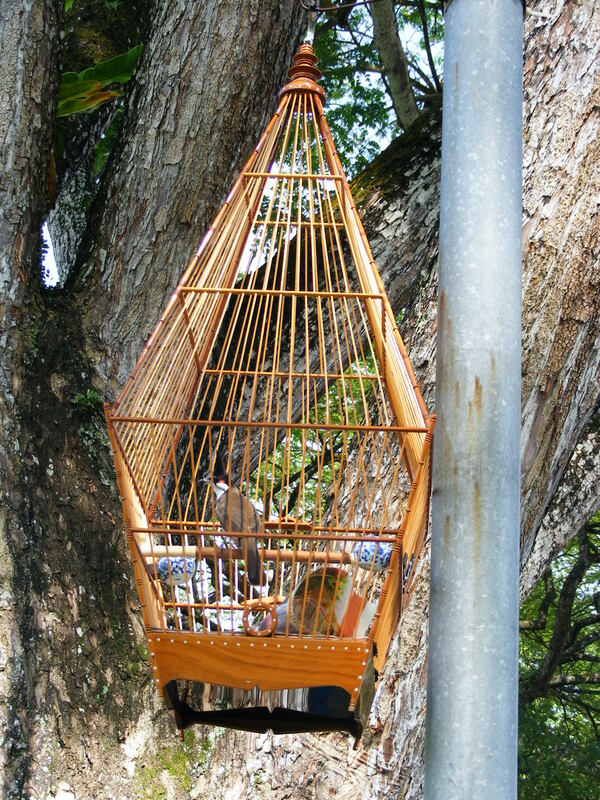 The bird owners hang their birds up and then retire to the shade to chat, and hang out. 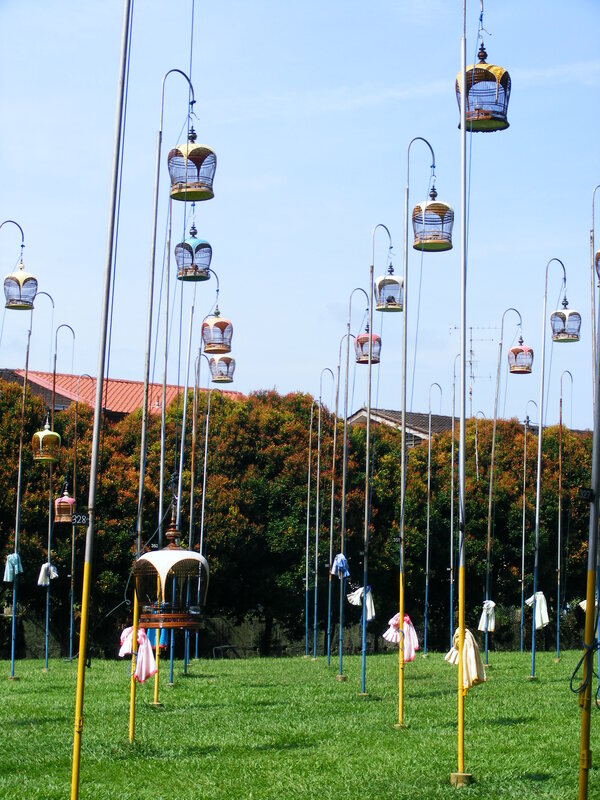 A forest of bird-cage poles. 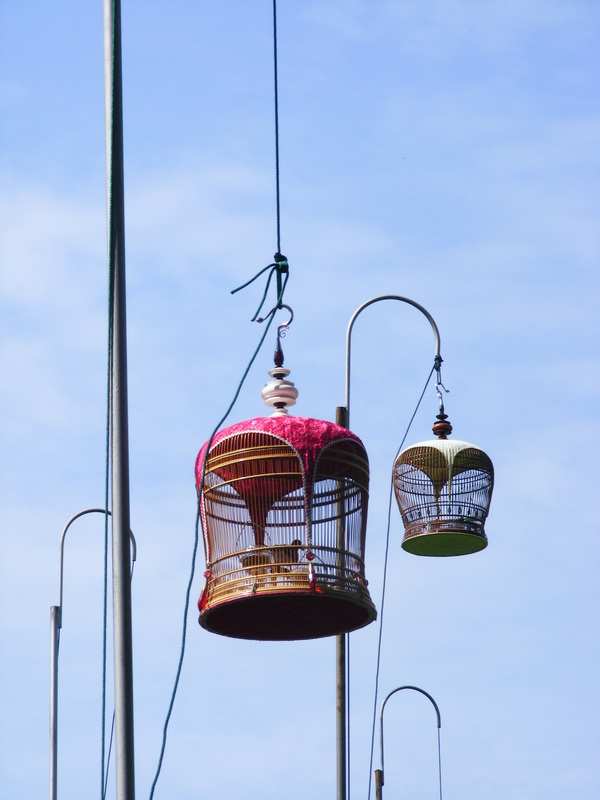 Hoisting the caged bird up. I love the exactness of the poles positioning. Very precise! I wonder if it’s frustrating for the birds to see this much sky and not be able to fly? Chess and a lawn full of bird pole. The quieter part of the field. 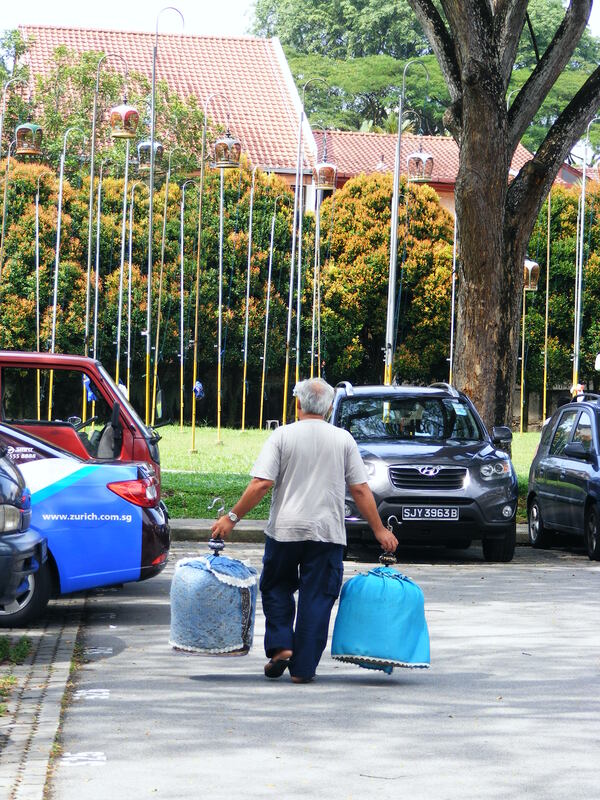 Taking his birds for a walk. I’d fill you in on all the details about what sort of birds they have, but I’m not very knowledgeable/interested in birds so I have no idea! Some appeared to be dove-type birds, and others had a red feathery spike on their heads but that’s all I know. Sorry! 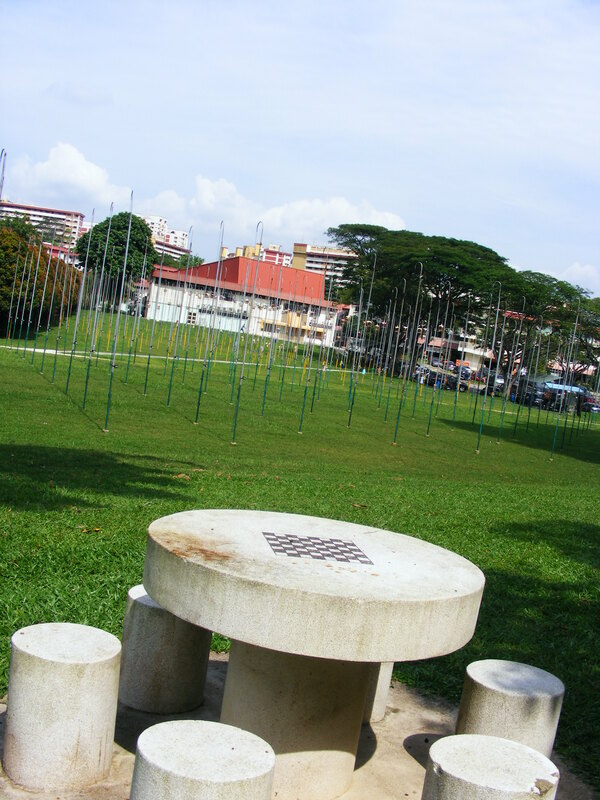 the open field behind Block 159 Ang Mo Kio Avenue 5. Parking is by coupon and admission is free. This entry was posted in Off The Beaten Track by KJ. Bookmark the permalink. That’s fascinating! No doubt this brings up some mixed feelings for me on the caging of birds but at least they are getting socialised and given the opportunity to sing, which makes birds and humans alike happier. Great shots, thanks for sharing. I love the name ! Bird singing club 🙂 Lovely pictures though i agree, its frustrating to see the birds being caged when they should be flying freely . But, its good that they can socialise with other birds and sing to their heart’s content.